Santa has come a little early for fans of our annual LE series. The first shipments of the January LE18 varietals have been delivered a couple of weeks early and are in-stock, ready to start (or pick up for home winemaking) at Just Fine Wine. If you placed a pre-order for one or both of these wines, please drop into the shop (if you have not done so already) and we can get yours started. Just think, after a quick 8 weeks you’ll be enjoying the latest batch of fantastic Limited Edition wine. For anyone who missed the pre-order deadline or for those who are interested in topping up their orders, we have an extremely limited number of “overstock” kits available for purchase. Act fast, these extras are available on a first come, first served basis and never linger on the shelves. 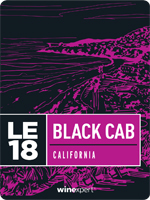 LE18 Black Cab – Lodi, California, USA – NOW AVAILABLE! REGION: LODI, CALIFORNIA, USA – Grapes have long been a part of the Lodi landscape, where bountiful wild vines used to grow along riverbanks. From the first planted vines in the mid-1800s, the region has flourished into a world-class producer, with most of the land dedicated to red wine grape varieties. Lodi’s grapes benefit from a Mediterranean climate of warm days and cool nights, and a dry growing season which allows growers to precisely manage vine growth through irrigation. Two mountain-fed rivers run through the region bringing rich granite-based minerals to the soil which lend complex flavours to the grapes. WINE: Black Cab is an intriguing blend of Cabernet Sauvignon and Gamay Noir. Gamay is a light-bodied red wine revered for its floral aromas and earthiness, with tart red berry and lively acidity. Cabernet Sauvignon is a full-bodied red loaded with black fruits, cherry, black pepper and hints of earth. This balanced blend marries the best of both varietals into an energetic medium-bodied beauty. Ripe and round with vibrant acidity and silky-smooth tannins, expect pronounced cherry and juicy red berry flavours rounded out with notes of cassis, spice, subtle earthy undertones and soft vanilla. Pair with grilled red meats, pizza, black peppercorn tuna, black bean stews or roasted pepper dishes. LE18 PAIRING: Golden Couscous Stuffed Peppers. CLICK HERE for Recipe. 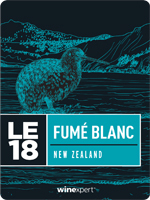 LE18 Fumé Blanc – Hawke’s Bay, New Zealand – NOW AVAILABLE! oaked Sauvignon Blanc, the name is derived from Pouilly-Fumé, a popular French appellation that specializes in a similar style wine. Made with lush New Zealand Sauvignon Blanc, this mouth-filling wine delivers a rush of ripe tropical fruit on the palate, with complex layers of gooseberry and melon, bright acidity and hints of grassy mineral notes expertly harmonized with a gentle creamy vanilla oak. Pair with goat cheese, seafood platters and chicken or pasta dishes with creamy sauce and spring vegetables. LE18 PAIRING: Orzo with Peas and Goat Cheese. CLICK HERE for Recipe.